The subject of labor is one of three basic factors of the production process (Marx, 1967, p 174), along with human labor, and the means of labor (tools and infrastructure used to transform the subject of labor). The subject of labor and the means of labor comprise the means of production of society (Institute of Economics, 1957). Subject of labor is sometimes called object of labor (e.g., Sheptulin, 1978). In both cases, the term refers to what is being worked on. 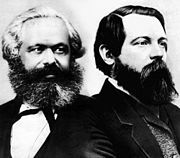 Marx, Karl (1867 | 1967). Capital Vol. I. New York: International Publishers. Internet copy. Sheptulin, A. P. (1978). Marxist-Leninist Philosophy. Moscow: Progress Publishers. This page was last edited on 28 November 2017, at 14:30 (UTC).